Have you ever stuck a fork into some food and said that you wished you had the recipe? I did when I had this cake the second time. It is THAT good! Oh, and as a bonus for those who care, the cake itself ... it's actually Vegan! Yeah, no milk, no eggs. But this cake is excellent as is. One of the best Chocolate Cakes I have had in memory. It is a chocolate cake recipe from the Great Depression Era, when they had to be thrifty and scrimp on every corner they could. But... whoever came up with this recipe came up with an amazing cake. I find it every time I look for a chocolate cake recipe, and it haunted me until I took the time to make it. You will find recipes like this one every time you search. Some add things to it that are unnecessary and added fluff. You can have it plain, without icing, and just a bit of confectioner's sugar on top. I opted for a rather simple buttercream icing and am really glad I did. The trimmings I had of the cake to make it round the first time out tasted almost as rich as a brownie. It stayed moist in the refrigerator longer than I expected, which is a big bonus. My regular recipe is good, but this is better. Add to a large mixing bowl (I recommend a stand mixer, but that is for speed) all your ingredients saving the vinegar for last. Pour into floured and buttered 8 by 8 inch pan. Bake at 350 for 30 minutes or until the toothpick comes out clean when tested. 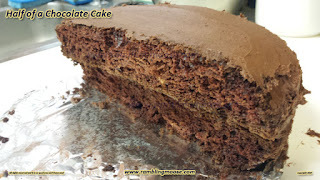 To make a more modern sized cake, I doubled the ingredients and got a two layer 9 inch cake. Yes, Double the ingredients. I did say Depression era and 8 by 8 one layer was the original size. I also Doubled the icing for a 2 layer, 9 inch cake. 8 by 8 inch is a 20cm square. 9 inch round would be 23 cm. Note: On Feb. 12, 2017, we wanted this cake again. I made one layer worth of each. The cake rose so tall that I think you probably could make one layer worth of batter, but split it in half to get normal height layers. Also for the Icing - Start with one Tablespoon Milk in your mixer. It will be dry and dusty. I added TWO Tablespoons of Milk and was able to get the icing to stand tall and full of lightness and air. The longer you mix it, the better it seems to get.